I was sitting outside taking photos of all the birds we get in our yard, and this guy appeared out nowhere. At first I didn't know it was a fox, because it didn't look anything like the healthy fox that I had seen a few days before. I called Animal Control, because it looked so sickly. Its fur was very sparse, and I could see his dry, cracked skin underneath. He didn't try to attack. He just stopped in the shade to scratch himself and then just walked away. I saw one similar to this poor fox in Maine. He ran away from me so I knew it wasn't rabies. I stopped at the local police department and from my description they told me he had mange. Raelou, that is exactly what I was going to suggest, mange. Poor, poor animals. I hope someone is able to do something for these pitiful creatures. Very sad. I'm hoping that someone will know how to help these animals. 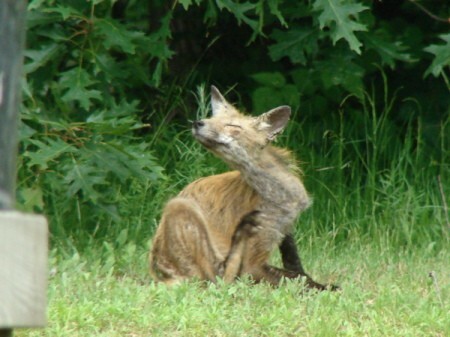 Don't we pay "Wild Life Services" to take care of problems that our animals like these foxes have? We need to find someone who will take care of them if we're paying the wrong people. 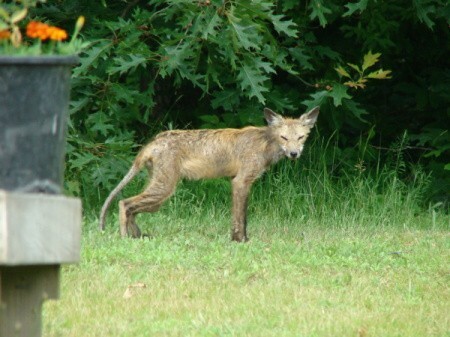 We live in Maryland and I've also seen red fox in our yard for the past two weeks. They don't look like this one he does look sick I hope someone can do something for him. Poor thing! The two we've seen are scouting around for food they eat rodents, rabbits, squirrels, pet food even bird food, birds and their eggs, berries and they could be after our two cats so were trying to be careful not to let our cats out unless were with them. I love wildlife but from a distance one of these foxes walked right by my DH and I while we were sitting outside enjoying a cup of coffee he wasn't even in a hurry and he sure wasn't afraid of us. Heck in another life I might have given him a name and left him hang around but this isn't that life for that life is also gone. Sometimes I feel sorry for the wildlife, were taking their homes and now their walking around our yards like it's theirs guess and I guess my yard was their woods at one time. I can't blame them completely can you? But still I would like them to keep their distance. I am not going to stop feeding my birds and we only feed the squirrels so they will stop eating from our birdfeeders. Remember the days when wildlife only came out in early morning or early evening from a distance, or you might see them at night when you drove down your driveway? Those days are gone in some areas forever now they come out anytime. I'm wondering how everyone else is dealing with their wildlife?